Chef Riccardo Bertazzoni and Chef Stefano Dal Ben of the Italian restaurant Di Vino by the Glass Bar in Playa del Carmen bring a delicious taste of Italy to the Riviera Maya, Mexico. The restaurant has Italy well represented from the North to the South with owners Nicola Iorio of Naples, Riccardo Bertazzoni of Milan, Stefano Dal Ben of Venice, and Daniele Personali of Rome, whose culinary vision is one of style, taste, and presentation. 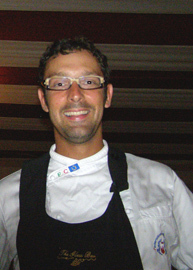 I had an excellent dinner at Di Vino by the Glass Bar while I was in Mexico in May 2008, and met with Chef Riccardo Bertazzoni to learn about the culinary concept behind the restaurant whose focus is on modern Italian cuisine from all parts of Italy like the owners themselves. Combined with the right mixture of tradition and elegance, Di Vino by the Glass Bar has all the right recipes. 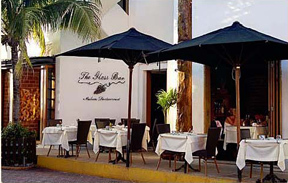 The restaurant opened in 2003 and has a tempting innovative menu and a large selection of wines. Chef Riccardo and Chef Stefano share their recipes for a tasty two-course menu. Method: Sauté the filet of Chilean sea bass with olive oil, garlic, and rosemary. Sauté the vegetables with olive oil, and then add the rice wine vinegar and fish stock to finish. Serve the filet with the vegetables. Method: Sauté the veal chop, add the demi-glace and 2 tablespoons of meat stock, and cook over a low heat. Sauté the mushrooms with olive oil and garlic. When the mushrooms are done, make a slice in the veal chop and stuff with the mushrooms. Serve with baked potatoes. Read other articles about Di Vino By the Glass Bar in the Restaurants section and Chefs' Recipes section in Spanish.